Our newest data story reveals what happens to your body when your favorite team has skin in the game. 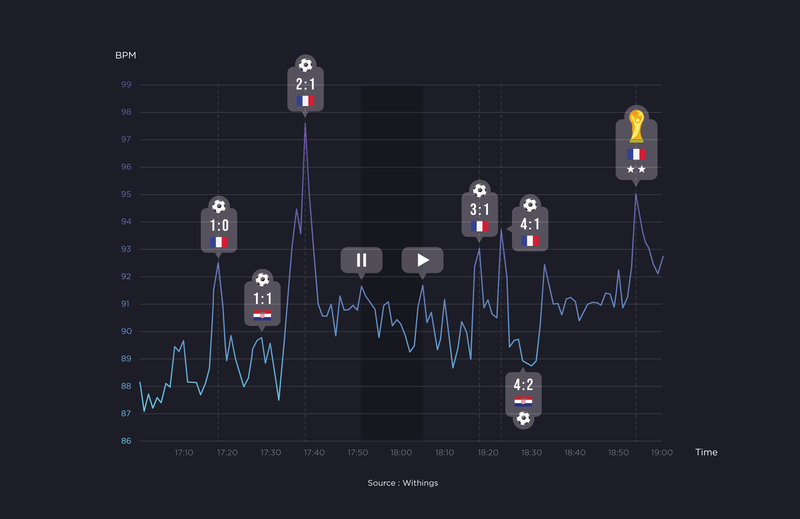 See the results we collected from users across France who opted into our study and then used continuous heart rate tracking during the 2018 World Cup Final. We recently explored many of the reasons why sleep during the World Cup seemed to be in short supply all over the world. As you can see from the above, the highest BPMs (beats per minute) during the final were recorded during France’s 2:1 lead, and then again during the team’s historic final goal. We hope you enjoy seeing this snapshot of the physiology of fandom. Many thanks to our loyal users in France who helped us out by participating and congratulations to your 2018 World Cup Champions! This study was conducted by based on data gathered from a panel of nearly 7,000 users of Steel HR hybrid smartwatches. Withings guarantees the confidentiality of personal data and protects the privacy of all its users. Therefore, all data used for this study was rigorously anonymized and aggregated in order to avoid any re-identification.